Primary hyperparathyroidism, gastroenteropancreatic neuroendocrine tumours (GEPNET), and pituitary tumours were seen in 94·4%, 58·6% and 49·6% of patients, respectively. The prevalence of insulinoma was higher in the Japanese than in the West (22%vs 10%). In addition, 37% of patients with thymic carcinoids were women, while most were men in western countries. 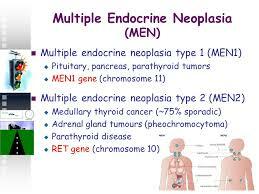 The MEN1 mutation positive rate was 91·7% in familial cases and only 49·3% in sporadic cases. 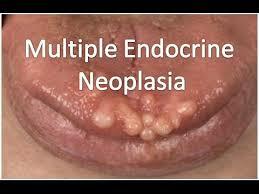 Eight novel mutations were identified. Despite the availability of genetic testing for MEN1, the application of genetic testing, especially presymptomatic diagnosis for at-risk family members appeared to be insufficient.